After the success of out first Wimbeldon post we thought we'd try some more tennis related fun. This time we attempted a giant version of marble painting. 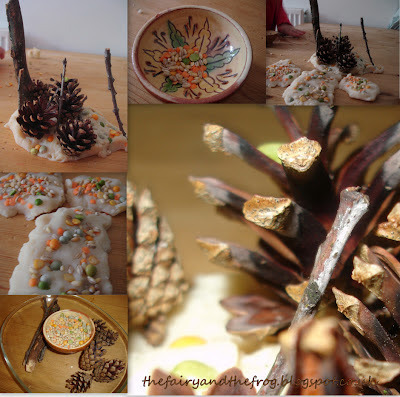 It was great for mark making as well as sensory exploration. 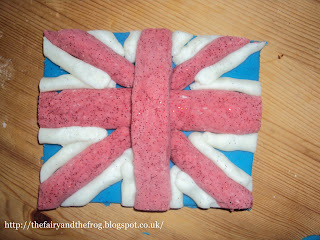 If you've not tried using gloop before - give it ago -its amazing how it changes state from liquid to solid. This morning had been a little fraught (check out my facebook page if you want to find out why!) - this was the perfect 'calm' down activity for the afternoon. 'The Very Hungry Caterpillar' is a popular bed time story in our house, we even have a CD version for the car. 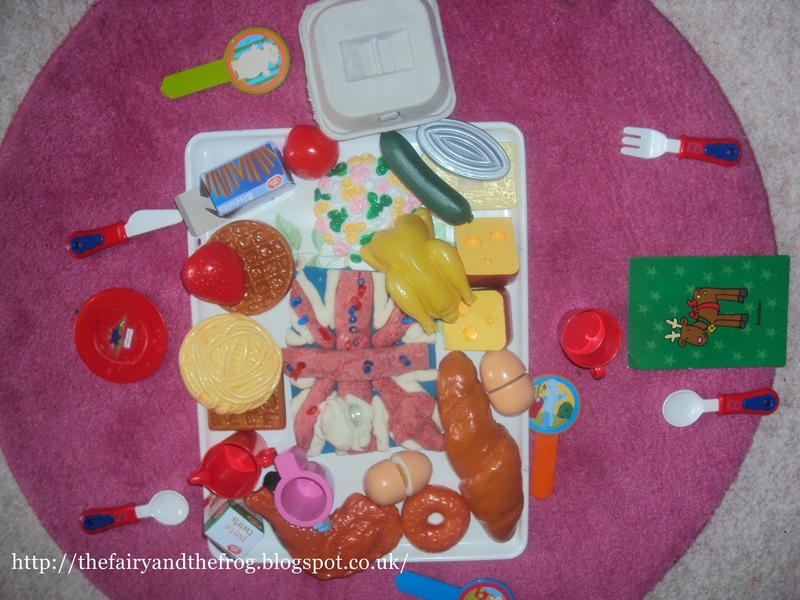 So for 'The Fairy's' 2nd birthday we had a very hungry caterpillar themed party. I have thought about blogging about the party before (it happened over 18 months ago!) but with other more recent stuff to blog about it never happened. After seeing this post and realising that Eric Carle (the author of the Very Hungry Caterpillar) had a birthday today I thought now would be a great time. 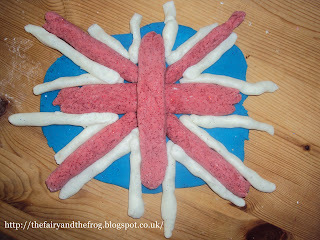 Here was the centre piece ( I got the idea from this blog)- using fairy cakes (or 'cup cakes') was great as I didn't have to spend ages cutting the cake - we just bunged them on a the plate for the little ones. 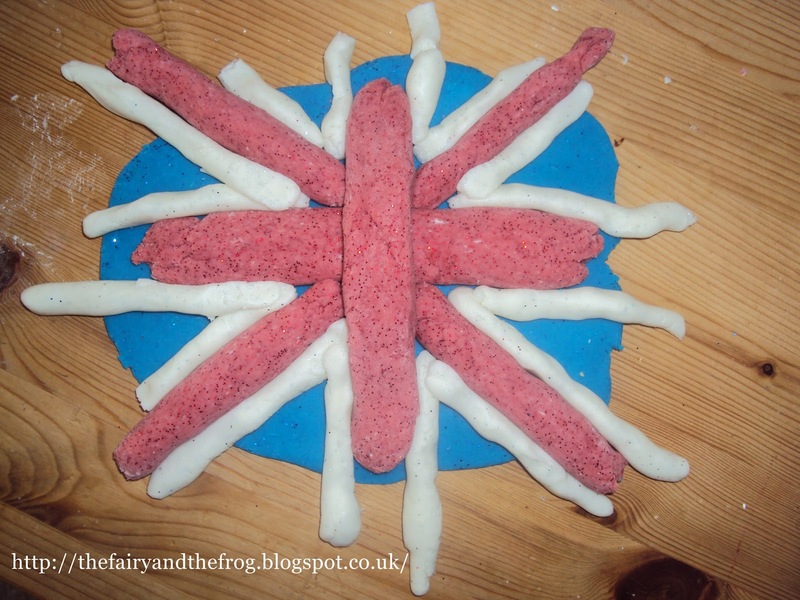 It also meant that we could cater for dietary preferences the 'The Fairy's Aunty cooked some low sugar- un iced ones for friends who prefer thier kids not to eat too much sugar (so if children had intolerances using cup cakes rather than one big one could be helpful too). I have since discovered icing gel paste, here I used the liquid stuff and it didn't colour the face as bright a red as I would as liked. For games I made a 'throw the food in the caterpillar' out of an old cardboard box. We also had a sun pinata. To decorate I made items of food from the book out of craft foam (I always seem to have more craft foam in my craft box than a person could humanly use in a life time - but that's another story). I stuck the pictures of with blue tac. 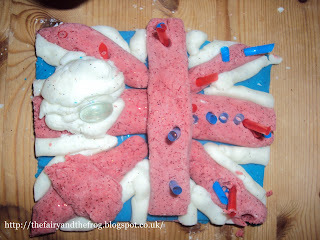 This post should have gone live last week but things got busy! Here is the The Frog's first craft activity (aged 8 months). Baby finger painting. Then I let the Frog loose with some paint- I thought he might like this as he loves to bang things- and he did (infact so much so I quickly whipped some more paper under his hand for a second go). Handy tip - If you try this at home remember wet wipes to clean their hands- I didn't and ended up with paint in my hair! The Frog loved joining in and copying his sister. Soon everything that could be washed was being washed. So simple yet so fun. 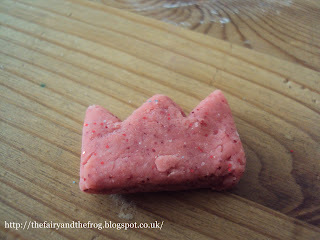 Take one lot of unflavoured playdough add natural 'treasures' gathered by small people, throw in a few dried pulses. 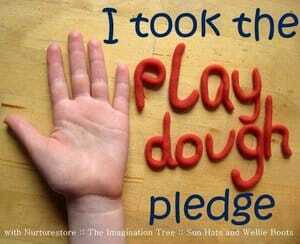 We had planned to do 5 x sessions on the playdough pledge, but we haven't (yet!). Not sure if we'll carry it on over the weekend - we'll have to wait and see how it all pans out. We've had fun doing the things we've done! We love challenges and we love playdough - what could be more fun than a playdough pledge. The lovely bloggers over at Nurture Store, The Imagination Tree and Sun Hats and Wellie boots have set us the challenge to 'Do something different with playdough this week'. 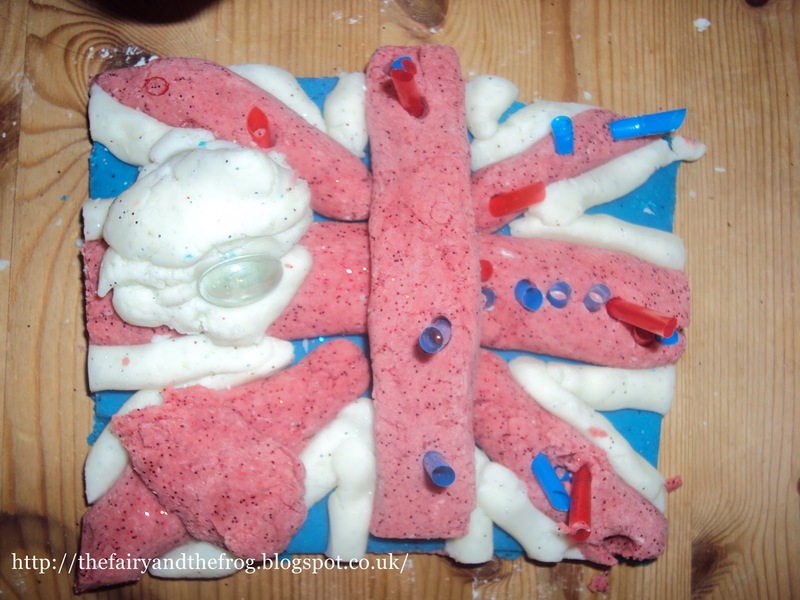 They have supplied recipes, ideas, a pintrest board and even a video to help inspire the playdough fun. I asked 'The Fairy' what we should do and she wanted to make purple play dough (although the end result does look more grey than purple! ), which unbelievably given the amount she loves playdough and the colour purple it's a new one for us. Quickly she decided on making a butterfly and had lots of fun re arranging the sparkle spots. Who turned into a caterpillar by shedding his wings (reverse life cycle anyone!) and then a wiggly worm. 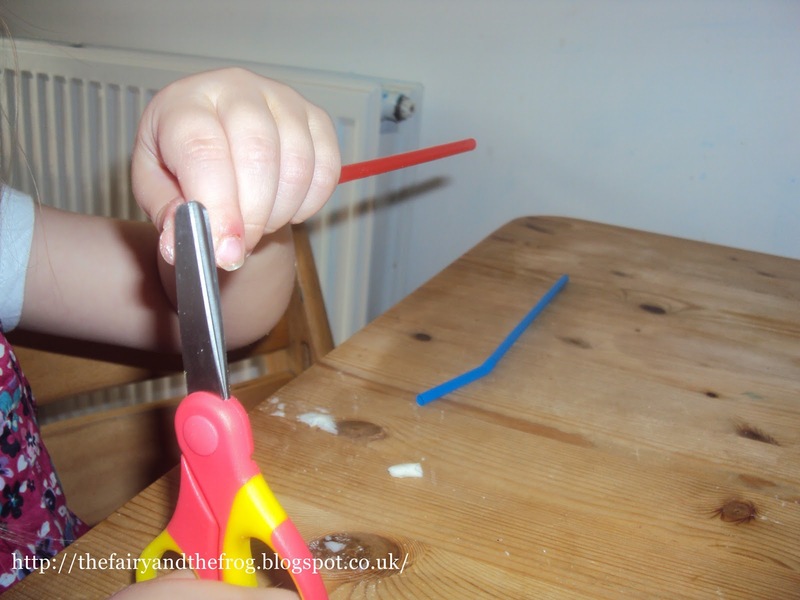 Then we experiment with printing using straws. Well Father's Day is nearly upon us so thought we'd be unusually prepared and post how we have made our Father's Day card. 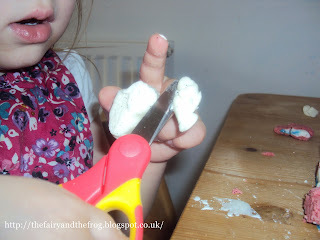 Ages ago we made some prints from shaving foam using this technique but didn't know what to do with the prints (so we kept them because I'm can't bear to throwing anything away love keeping all the beautiful things we've made!) So whilst hunting through our craft boxes (we have multiple boxes as there is too much stuff for 1 - I really do need to de clutter/ organise them better, but that's a whole other post) I found them and thought they were perfect for 'up cycling'. I cut out the word 'Papa' (as my husband is Spanish so we call him Papa not 'Daddy') and 'The Fairy' arranged the letters on contrasting card. 'The Fairy' chose to add a drawing and a heart cut out of the same pattern as the front of the card. Hey presto a home made Fathers Day card. Perfecto! Me 'Er... we can try!' So we did. Who needs paintbrushes when you can use petals! We made a rectangle out of blue sparkly dough and then added red and white crosses. 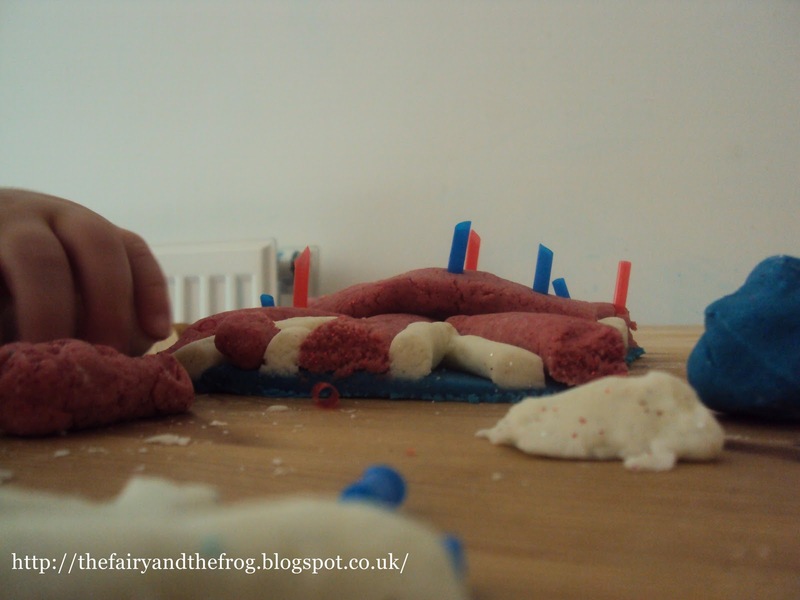 I wanted the red to look more vivid but didn't have the time to spend ages mixing playdough as I knew we were on borrowed time as 'The Frog' would soon be awake from his nap. 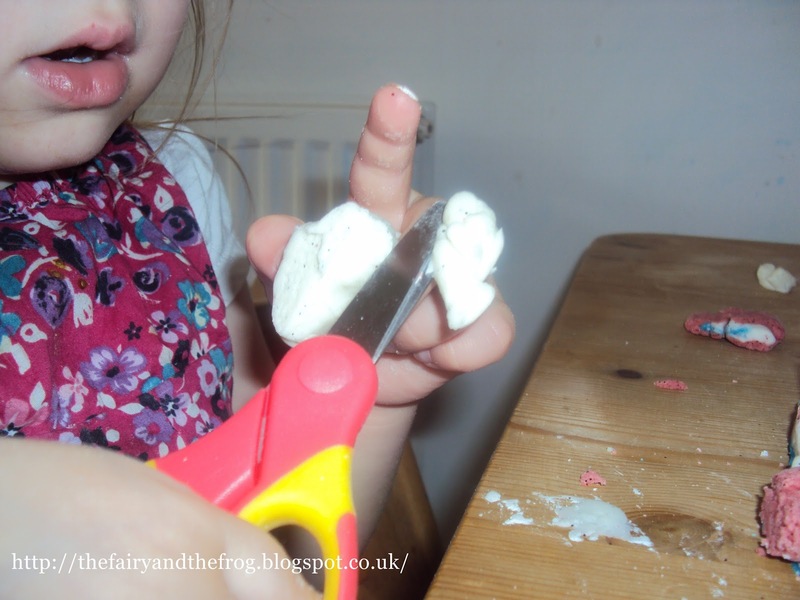 After we had finished I asked 'The Fairy' requested to do some more cutting. 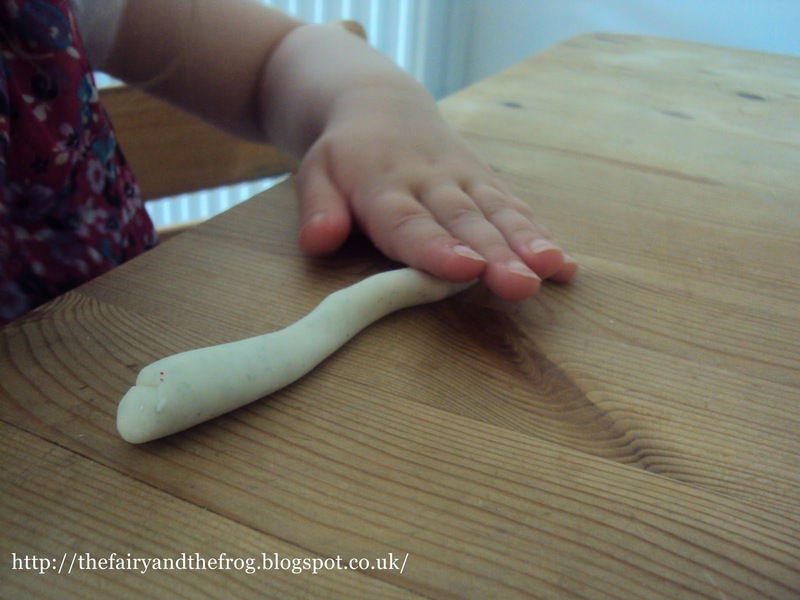 I was a bit puzzled (I wanted to play with the playdough still !) but went with the flow. Searching the cupboard for items to cut I found some straws. We also cut a crown. Every cake needs a picnic.